After nearly a decade overseas as a war reporter, the acclaimed journalist Dahr Jamail returned to America to renew his passion for mountaineering, only to find that the slopes he had once climbed have been irrevocably changed by climate disruption. In response, Jamail embarks on a journey to the geographical front lines of this crisis--from Alaska to Australia's Great Barrier Reef, via the Amazon rainforest--in order to discover the consequences to nature and to humans of the loss of ice. In The End of Ice, we follow Jamail as he scales Denali, the highest peak in North America, dives in the warm crystal waters of the Pacific only to find ghostly coral reefs, and explores the tundra of St. Paul Island where he meets the last subsistence seal hunters of the Bering Sea and witnesses its melting glaciers. Accompanied by climate scientists and people whose families have fished, farmed, and lived in the areas he visits for centuries, Jamail begins to accept the fact that Earth, most likely, is in a hospice situation. Ironically, this allows him to renew his passion for the planet's wild places, cherishing Earth in a way he has never been able to before. 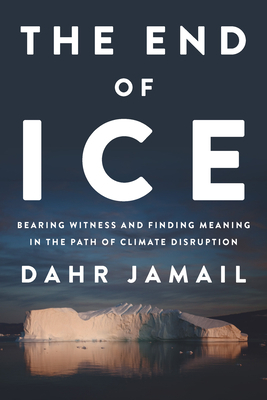 Like no other book, The End of Ice offers a firsthand chronicle--including photographs throughout of Jamail on his journey across the world--of the catastrophic reality of our situation and the incalculable necessity of relishing this vulnerable, fragile planet while we still can. Dahr Jamail, a Truthout staff reporter, is the author of Beyond the Green Zone: Dispatches from an Unembedded Journalist in Occupied Iraq. Jamail has reported from the Middle East over the last ten years, and he has won the Martha Gellhorn Prize for Journalism. He lives in Washington State.